Robert Ffolliott is a convicted criminal who was transported to Australia for his crimes. He has managed to escape and return to Ireland where his fiancée Arte O’Neil lives. But all is not as it seems, as Robert was tricked into his crime. He was convicted of being a Fenian but he is actually a gentleman with no such political leanings. A local man, Kinchela, fooled Robert into his false confession. Kinchela has designs on Robert’s fiancée Arte and needed him out of the picture. The army has been alerted to Robert’s presence back in Ireland. He needs to avoid them and to achieve this, he enlists the services of his old friend; the Shaughran. The Shaughraun is the creation of Dion Boucicault and was first performed in New York in 1874. Boucicault was an Irish playwright who was known as “the most conspicuous English dramatist of the 19th century” according to the New York Times, no less. 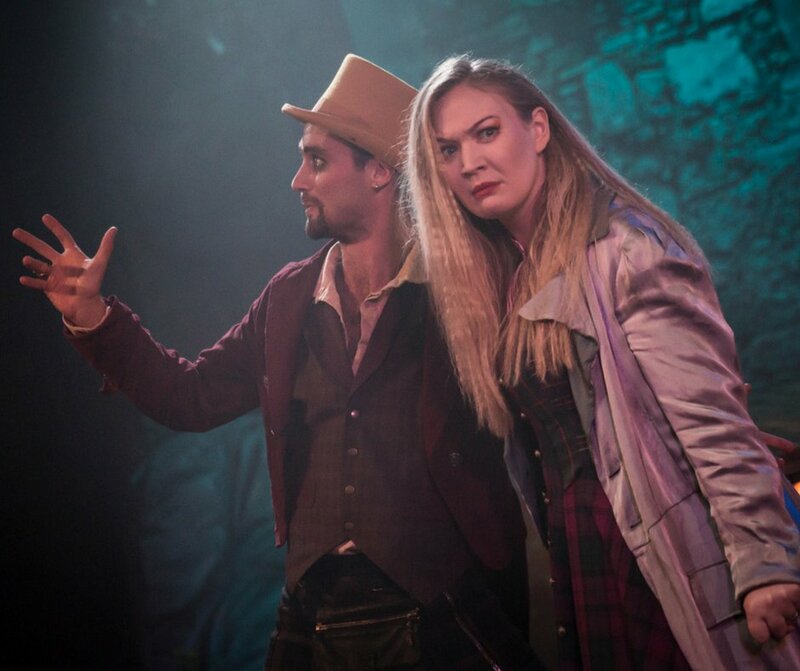 While his plays have diminished in popularity over the years, work such as The Colleen Bawn still makes regular appearances on the Irish stage. 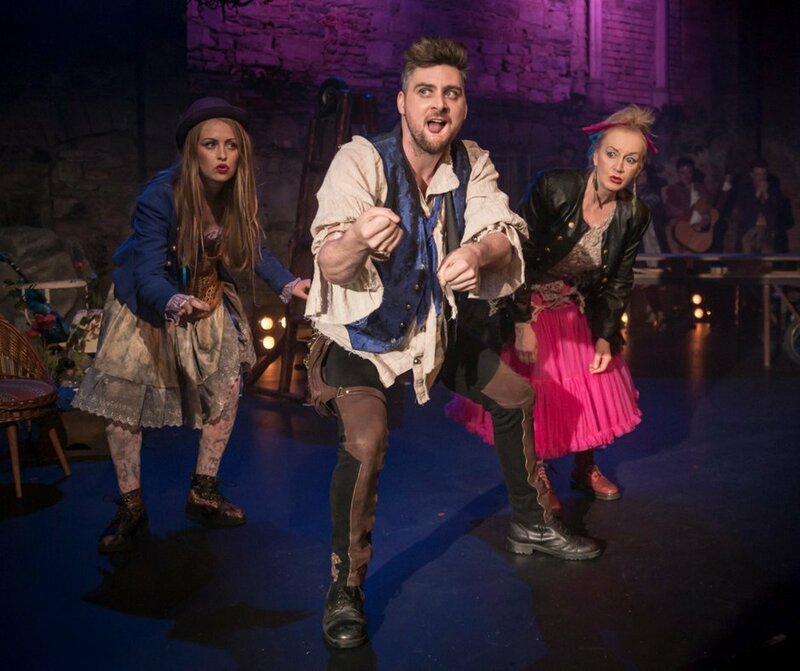 This production is by Smock Alley and it is a lively and fun piece. The play sets the mood right from the off as the cast arrives on stage playing a variety of instruments and singing. Each actor introduces themselves and gives a short insight into their character. The musical arrangements are not complex and they play simple repetitive pieces on their instruments but it is quite effective. The cast’s real skill is with their voices and there are some impressive vocal harmonies. The stage is scattered with all sorts of odds and ends, which the cast use to create the various locations required. Their costumes do not set a particular time or place, but give the feeling of a collection of travelling minstrels or players. It is not a classical or formal interpretation of the work. The play aims to be fun and puts a lot of energy and life into it, along with some musical interludes. Liam Heslin plays the Shaughraun and he bounds around the stage with a wry grin on his face throughout. It is an impressive physical performance that sets the mood. Juliette Crosbie also impresses with her vocal performance. She is a well-known jazz singer in Dublin and is the strongest vocally of the cast. David Fennelly provides many of the best comedic moments with his interpretation of Captain Molineaux, the English Army captain assigned to the region. The stage time is almost two hours and was possibly a little long for such a high octane affair. It is hard to keep the energy and concentration levels up throughout. The story is a caper, as our heroes avoid the constabulary while trying to prove Robert’s innocence and reunite the betrothed couple. The work has elements of farce along with some intricate wordplay but despite this, it bounds along at an impressive pace. Whatever this production is, it is never dull! If you’re looking for something lively and effervescent, you need look no further.